Today’s post features another shot from the archives from last spring…the setting sun illuminates one of the abutments on the Memorial Bridge. The seacoast got some bad news recently when it was notified that the Memorial Bridge project did not receive the $70 million in federal funding that it needed to proceed with a full repair of the bridge as needed. Now the historic structure’s fate hangs in the balance as a study is underway to determine the cost to repair the Memorial as well as the Sarah Long Bridge (Middle Bridge), and the most appropriate outcome given how integral the bridge is to the communities of Kittery, ME and Portsmouth, NH. I certainly hope it will continue to live what has been a long life. After the weather of the last few days, let’s stop and reflect on the fact that April is only 32 days away. The decks will soon be open, and the trees will be back in bloom with blue skies and the return of the green vines. 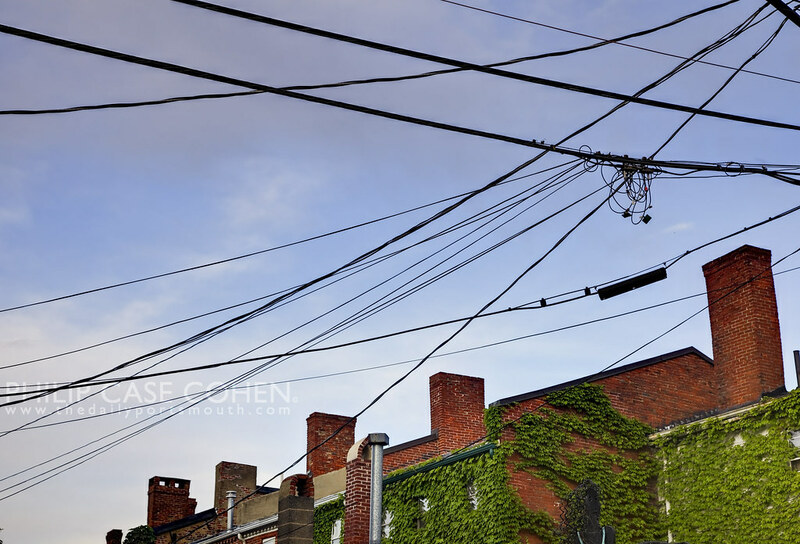 Above, the power lines hang above Ceres Bakery on Penhallow Street and the chimneys of Sheafe Street. 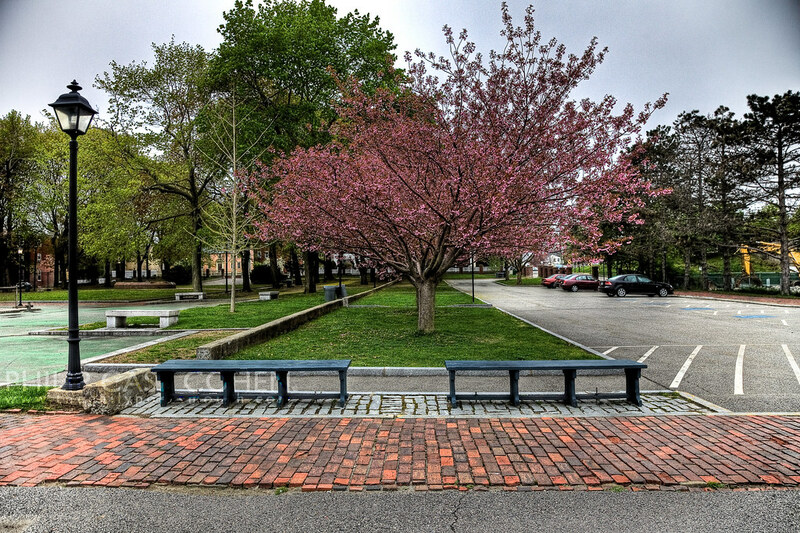 Below, a shot of a tree in bloom at Prescott Park…a re-post of one of my favorites from warmer days. Hope everyone is doing well through this weekend and has their power back or has found a way to stay warm. Two views of the Portsmouth Waterfront both depict the buildings of Bow Street earlier this year during the fall. In both shots the former Martingale Wharf building can be seen in between the steel beams of the new structures built up around it. The building has since come down, and is in the process of being rebuilt. I’ve always enjoyed the changing colors of the water and the sky and how the beautiful & varied brick buildings on Bow Street always stand out. In the shot below, you can see the North Church glowing next to the St. John’s tower. More shots from the South End at sunset. I love the way the light is grazing rooftops and the newly renovated steeple of the South Ward Meetinghouse aka The Children’s Museum. As I’ve mentioned before, the Sheafe Warehouse is one of those really old structures that I’ve always loved, and that I picture located in town a couple hundred years ago when it was still a young structure. Nothing too exciting about these shots, just beautiful old architecture and some nice afternoon light. 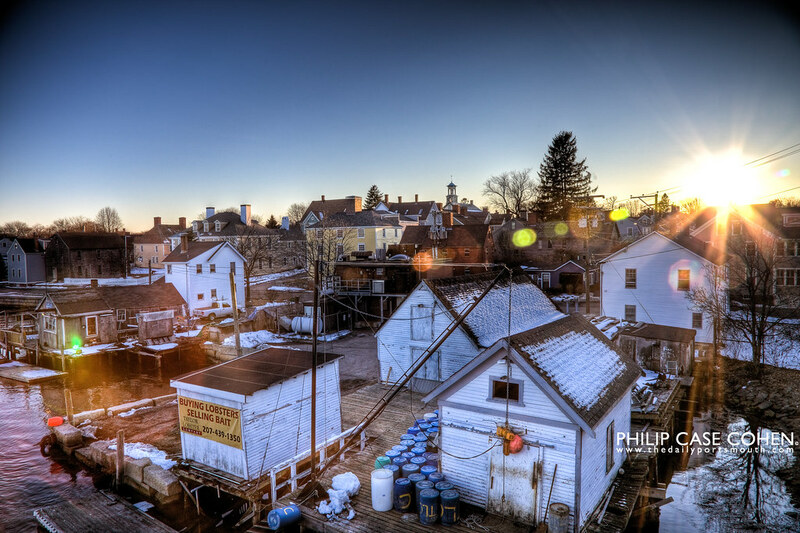 Today’s post poses a question, to HDR or not to HDR? HDR stands for High Dynamic Range, and I’ve begun to use the abbreviation as a verb with friends & family as we joke about the process (which uses multiple exposures overlaid on top of each other to reach a broader dynamic light range)….but as you can tell from scrolling through the website, it’s something that I truly enjoy doing – as I find that it’s similar to the darkroom black & white processing I learned to do in college. The digital post processing is still the romantic part to me (although shooting the scene is still most important), where it is up to you to create your vision. I use it mostly to try and replicate what I saw with my eyes when I was taking the photos. A single exposure often feels too flat to me, still beautiful – but short of the memory I have of the particular scene/experience. To serve as an example, I’ve posted two versions of one of my all-time favorite images – the sunrise shot taken of the Peirce Island Boat Ramp. The first is the “HDR” version, while the image below is nearly “out of the camera” with minimal additional tweaking. Regardless – it was clearly a beautiful scene, but I’m curious to hear – which do you prefer? In the late afternoon I decided to visit the usual spots before trying to inspire myself to shoot in some less traveled areas. On my way out of town, I decided to check out the late afternoon light in the South End at Prescott Park. On the Peirce Island Road Bridge I saw the sun glinting directly in my direction, which can make for some terrible photos – but being the stubborn person I am, decided to try anyway to see what I could come up with. The shot above is the end result, which I happen to like because of the sun streaks and the muted colors – yet the character of the neighborhood still stands out. It was beautiful on the seacoast this weekend, reaching almost 50 degrees on Saturday. I had a good time shooting, and worked on my first portrait assignment…more to follow on that later this week. I made sure to visit a few spots throughout the weekend, as I’ll be sending the camera in for repair this week and will be without for a few days. I’ll be featuring shots from this weekend, and some of the greatest hits from the past year. Today, I hope you enjoy the beautiful sunset from Sunday night, taken along the Rye coastline (in very windy, cold air!). Untitled from Philip Cohen on Vimeo.